Background In the UK, transnational tobacco companies (TTCs) have been arguing that levels of illicit trade are high and increasing and will rise further if standardised packaging is implemented. This paper examines trends in and accuracy of media reporting of, and industry data on, illicit tobacco in the UK. Methods Quantification of the volume, nature and quality of press articles citing industry data on illicit tobacco in UK newspapers from March 2008 to March 2013. Examination of published TTC data on illicit, including a comparison with independent data and of TTC reporting of Her Majesty's Revenue and Customs data on illicit. Results Media stories citing industry data on illicit tobacco began in June 2011, 2 months after the Tobacco Control Plan for England, which heralded standardised packaging, was published. The majority of data cited are based on industry Empty Pack Surveys for which no methodology is available. For almost all parts of the country where repeat data were cited in press stories, they indicated an increase, often substantial, in non-domestic/illicit cigarettes that is not supported by independent data. Similarly, national data from two published industry sources show a sudden large increase in non-domestic product between 2011 and 2012. Yet the methodology of one report changes over this period and the other provides no published methodology. In contrast, independent data show steady declines in non-domestic and illicit cigarette penetration from 2006 to 2012 and either a continued decline or small increase to 2013. Conclusions Industry claims that use of Non-UK Duty Paid/illicit cigarettes in the UK is sharply increasing are inconsistent with historical trends and recent independent data. TTCs are exaggerating the threat of illicit tobacco by commissioning surveys whose methodology and validity remain uncertain, planting misleading stories and misquoting government data. Industry data on levels of illicit should be treated with extreme caution. This paper therefore aims to examine trends in media reporting of TTCs’ data on illicit tobacco penetration, to assess the accuracy of the TTCs’ data and their reporting of independent data on the extent of illicit tobacco trade in the UK. 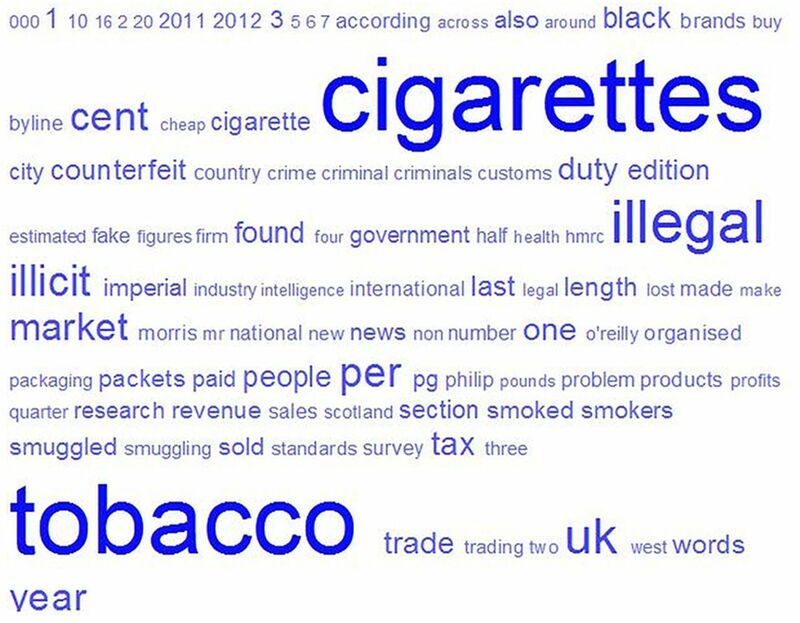 Media coverage of the illicit tobacco trade in UK newspapers (national, regional and local) between March 2008 and March 2013 was identified using the Nexus UK press database.60 Search terms included ‘cigarette and illegal’, ‘cigarette and smuggling’, ‘tobacco and illegal’, ‘tobacco and smuggling’, ‘tobacco and illicit’. Each set of terms was combined with the names of the major TTCs: British American Tobacco (BAT), JTI, Imperial Tobacco (IMT) and PMI. Only articles citing industry data or surveys on illicit were included, while articles referring to the illicit tobacco trade in general, but giving no data, were excluded. In addition to counting the number of newspaper articles each month, we categorised the data contained in each article by tobacco type (whether the data referred to cigarettes, RYO or both), tobacco company providing the data or mentioned in the article and other companies mentioned (eg, market research companies); methodology underlying the data; and whether the article clarified the nature of the data including the difference between cross-border and illicit. All articles were uploaded into NVivo to identify the most frequently used terminology. To further assess the accuracy of the coverage, we attempted to obtain the data underlying the press coverage by searching for industry press releases and reports published around the time of the press articles. Where data on levels of illicit penetration were available for the same geographic area over time (whether presented in the same or different press articles), these data were presented graphically using the year when the data were obtained rather than published. We aimed to identify tobacco industry data on illicit tobacco (both cigarettes and RYO) in the UK. However, an initial review indicated that the majority of industry data only measured NUKDP cigarettes (PMI data in its Project Star report were unique in being broken down into illicit and cross-border sales).8 ,24 ,61 ,62 Analysis was therefore restricted to NUKDP cigarettes. Project Star reports, produced annually for PMI, were the primary source of industry data as the early reports compile data from a number of industry sources, including the Tobacco Manufacturers’ Association (TMA), JTI's Pack Swap survey and PMI's EPSs.8 ,61 ,62 The other report examined was JTI's 2012, The Billion Pound Drop report, the most comprehensive, publicly available industry document on NUKDP cigarettes in the UK.24 Searches of the TTCs’ websites and press releases undertaken in March 2013 provided no additional data. Industry data were compared with data from independent sources, notably HMRC49 ,59 ,63 ,64 and a 2010 survey undertaken as part of a major EU research project, Pricing Policies and Control of Tobacco in Europe (PPACTE).18 ,65 For HMRC, we took the midpoint illicit cigarette market share estimate and added the cross-border sales estimate. For PPACTE, we took data on cigarettes only and combined data on illicit and non-domestic legal cigarettes as a proportion of total consumption using previous calculations.20 The PPACTE data cover England and not the UK. Finally, to assess JTI's reporting of HMRC data, The Billion Pound Drop report24 was searched for all mentions of ‘HMRC’, ‘Her Majesty's Revenue and Customs’ and ‘Government’ to identify all references to HMRC data on illicit. All data cited were then compared for accuracy against the original HMRC source. 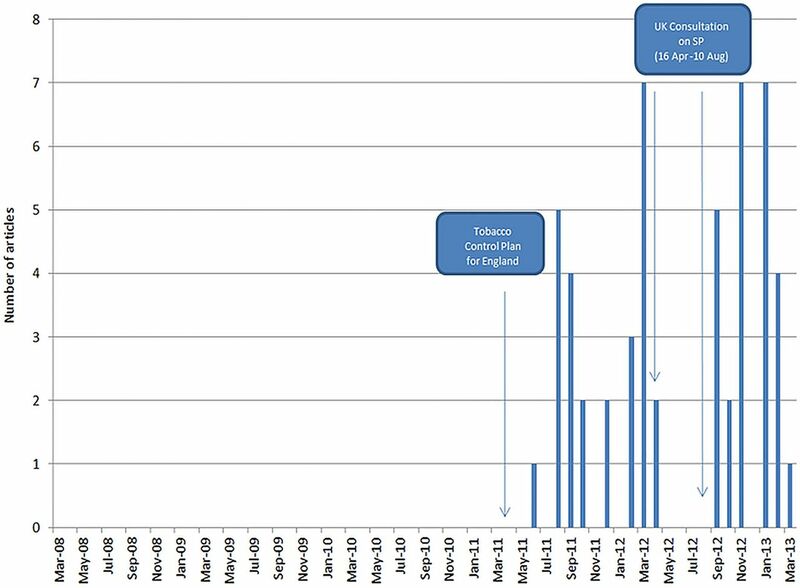 Between March 2008 and May 2011, no articles citing tobacco industry illicit trade figures were published in the UK media (figure 1). Following the publication of the Tobacco Control Plan in March 2011, articles began to appear—14 were published in 2011, 26 in 2012 and 12 in the first three months of 2013 alone. Number of press articles in UK newspapers citing industry data on illicit cigarettes and tobacco, 2008–2012, by month of publication. Of the 52 articles, 23 (45%) mention PMI,71–93 12 cite JTI (some referring specifically to The Billion Pound Drop report or the data contained in it),72 ,94–104 13 cite IMT (many relating to EPS figures it gave at its Annual General Meeting in January 2013)105–117 and 5 refer to a number of tobacco companies.118–122 (The total adds to 53 as one article cites separate data from PMI and JTI.) In all bar seven articles, these companies are clearly cited as the source of the data. In terms of underlying methodology, 17 articles explicitly refer to EPSs,71 ,73–83 ,105 ,107 ,108 ,118 ,120 and a further 24 to survey data known to be based on EPSs (eg, data in The Billion Pound Drop, Project Star or MS Intelligence surveys).72 ,88 ,89 ,91–93 ,95 ,98–103 ,106 ,109–113 ,116 ,117 ,119 ,121 ,122 No article explains the methodology in any detail. None of the articles explain the nature of the data or the difference between NUKDP and illicit. Article titles suggest the data refer to illicit, with 41 (79%) using the words illegal, illicit, counterfeit, fake or black market. The word cloud (figure 2) identifies illegal and illicit as the most frequently used words after cigarettes and tobacco. Yet, as we showed above, much, if not all, of the data comes from EPSs and the articles can therefore only present data on NUKDP rather than illicit. NVivo word cloud analysis of 52 newspaper articles citing industry data on illicit/Non-UK Duty Paid tobacco and published between March 2008 and March 2013; the larger the word, the greater the usage of that word in the articles. Tobacco industry and independent estimates of Non-UK Duty Paid cigarettes as a share of total consumption in the UK market, 2006–2012. Note: * 2012 KPMG estimates are based on a cigarette basis, whereas previous years’ data were based on a pack basis. Cigarette-based estimates are likely to lead higher estimates in the UK (see text). Her Majesty's Revenue and Customs (HMRC) data for 2010–2011 are coded here as 2011, data for 2009–2010 as 2010, etc. Pricing Policies and Control of Tobacco in Europe data refer to England rather than the UK. 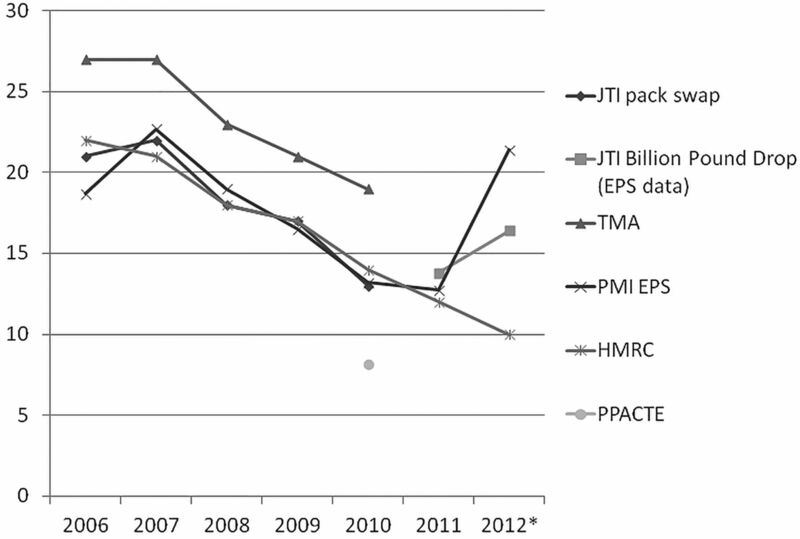 Source: JTI Pack Swap Survey as cited in Project Star 2011 report. TMA Empty Pack Survey (EPS) data as cited in Project Star 2011 report. PMI EPS data as cited in Project Star 2012 report (p. 199). (For 2011 and 2012, the figure presented is the average of 2 given for quarters 2 and 4 of the year.) HMRC data from Measuring Tax Gaps Tables, 2012 (Table 4.3): (we added cross-border shopping to illicit estimates) http://www.hmrc.gov.uk/statistics/tax-gaps.htm#3. HMRC data from Measuring Tax Gaps Tables, 2013: http://www.hmrc.gov.uk/statistics/tax-gaps/mtg-table2013.xls. For all regions other than London and Wales, JTI's The Billion Pound Drop data show an increase in NUKDP cigarettes between 2011 and 2012 (figure 5). In contrast, independent data show continued declines in illicit and NUKDP (table 2). For the southwest, independent data show a decline in the proportion of NUKDP cigarettes from 18% in 2010 to 10% in 201366 compared with an increase from 11% to 12% in industry data between 2011 and 2012. Although the other independent and industry data are not directly comparable—industry data measuring NUKDP cigarette penetration and independent data measuring illicit penetration (tobacco—ie, cigarettes and RYO combined—in the northeast and tobacco and cigarettes in the southwest), the differing trends are still apparent. In each of the four instances that JTI cited HMRC data in The Billion Pound Drop report, it cited HMRC's upper limit (or a secondary report using this upper limit) rather than the, more likely, mid-estimate without explaining this misrepresentation (table 3). In one instance, it claimed to be using 2011/2012 HMRC data, which were not available then. A number of findings are noteworthy. First, our findings suggest that the TTCs have deliberately sought to solicit press coverage on the illicit tobacco trade in the UK using their EPSs. Press coverage started just 3 months after the government committed to examine SP, peaked in March 2012, just prior to the consultation, and again in late 2012 following the consultation, a period when discussions about whether to proceed with SP were taking place. Second, the press coverage and recently published industry data appear intended to stress that levels of illicit are high and, in contrast to independent data, increasing rapidly. Almost all the press coverage detailing trends indicated that the market share of NUKDP/illicit cigarettes increased between 2011 and 2012 (figure 3). Two sets of formally published industry data from JTI24 and PMI62 also show increases in NUKDP cigarettes nationally and in almost all regions (figures 4 and 5). Yet this apparent increase is not seen in two independent data sources, which instead indicate that levels of illicit and NUKDP continued to decline to 2013.70 The sudden increase, identified in industry data in 2012, stands in marked contrast to the downward trend previously identified in all available industry and independent data (figure 4). While there is a small increase in the HMRC illicit estimate for 2012–2013, this is not close to the magnitude of the increases depicted in the industry data and press stories. A third key finding was the absence of detail on the methodologies underlying TTC data. Only four of the press stories could be linked to published industry data, JTI's The Billion Pound Drop report,24 which provides no methodological details. While PMI's Project Star reports are the only industry source that provides some methodological information, its limitations have previously been outlined.20 These methodological details show that the 2012 Project Star data cannot be directly compared with the 2011 data as a methodological change, from a pack-based to a cigarette-based measure, instigated in 2012 will provide an artificially higher estimate compared with previous years.62 This information was hidden in a tiny footnote on page 199 of the report, which had to be read in conjunction with a methodological appendix on page 215. It was not detailed in PMI's press release,128 which drew attention to the ‘increase’ in illicit in the UK. This could be interpreted as a deliberate effort to mislead. Potential limitations to our study should be considered. First, although we can document the timing and number of press articles citing tobacco industry data, we cannot prove the TTCs’ intent or role in generating these stories. Our findings are, however, consistent with recently leaked PMI documents that indicate that this was a deliberate campaign: the claim that SP ‘would increase illicit trade’ was one of four main arguments PMI planned to use against the policy.130 The leaked documents also talked of ‘using’ the company's 2011 EPS results as part of a media campaign.130 The fact that PMI published its 2012 Project Star report in April 2013, just prior to the announcement of the government's legislative agenda in May 2013, rather than in the summer when previous reports had been published, also suggests a deliberate effort to influence ministerial decisions. Second, we only examined newspaper coverage. However, the industry also promotes the illicit argument on social media. A brief review of @BATPress tweets from 1 November to 4 December 2013 showed that over a quarter (21 of 77) tweets focused on illicit. The second main shortfall in our study is that both sets of independent regional data66–70 come from surveys by the same organisation and only one provides data directly comparable with industry data. Although industry data measure NUKDP, while most of the independent data measure illicit, we show that, nationally, levels of cross-border sales have changed very little over this period and are therefore very unlikely to explain the increase seen in industry data. Other evidence supports our contention that the recent increase in NUKDP/illicit cigarettes in the UK is unlikely to be genuine. In Australia, almost identical industry claims about trends in illicit were made during government consultations over SP. A report by accountancy firm Deloitte34 prepared for the three large Australian cigarette firms claimed the market share of illegal cigarettes had increased from 6% in 2007 to 16% in 2010. By contrast, independent data suggested it was steady at 3%.133 The fact that consumption of legal cheap cigarette brands, the closest competitor to illicit, was steady also suggested that the claimed increase in illicit was highly unlikely.29 In the UK, a clear upward trend in the market share of ultra-low-price cigarettes,134 the closest competitor to illicit cigarettes, similarly casts doubt on industry data. In light of ours and others’ evidence that industry data on illicit are unreliable and likely to exaggerate the scale of the problem, governments should be extremely cautious about collaborating with industry to obtain data on illicit tobacco and relying on such data as is occurring in a number of jurisdictions.28 ,53 ,135 TTCs should be required to make their underlying methodologies public to verify whether the data measure non-domestic or illicit product and all industry data should be subject to expert external peer review before being made public. Journalists should be made aware of the misleading nature of tobacco industry data. Our findings also highlight the need for timely independent data on the scale of the illicit tobacco trade. This is the first paper to analyse tobacco industry manipulation of data on the illicit cigarette trade in the UK. An analysis of newspaper articles over 5 years reveals that, shortly after the possibility of standardised packaging was announced, the tobacco companies began and have subsequently continued, placing stories in the press that exaggerate the extent of illicit penetration in the UK, by confusing Non-UK Duty Paid (NUKDP) cigarettes with illicit. These press stories and recent formally published industry data suggest that illicit/NUKDP is rising sharply. In contrast, independent data show steady declines in non-domestic and illicit cigarette penetration from 2006 to 2012 and either a continued decline or small increase to 2013. Tobacco companies are exaggerating the threat of illicit tobacco as part of a public relations strategy to undermine public health measures such as standardised packaging. Their data and claims should be treated with extreme caution.
. Moving East: how the transnational tobacco industry gained entry to the emerging markets of the former Soviet Union—part I: establishing cigarette imports. Tob Control 2004;13:143–50.
. Change in tobacco excise policy in Bulgaria: the role of tobacco industry lobbying and smuggling. Tob Control 2014;23:e75–84.
. “Key to the future”: British American Tobacco and cigarette smuggling in China. PLoS Med 2006;3:e228.
. British American Tobacco and the “insidious impact of illicit trade” in cigarettes across Africa. Tob Control 2008;17:339–46.
. From cigarette smuggling to illicit tobacco trade. Tob Control 2012;21:230–4.
. Britain is centre of European cigarette smuggling racket; export-for-import how billions of smokes blow back to UK. Independent on Sunday. 9 December 2001.
. Big trouble at Big Tobacco. http://www.reportingproject.net/troubles_with_big_tobacco/ (accessed 18 Nov 2011). KPMG. Project Star 2010 results. 2011. http://www.pmi.com/eng/tobacco_regulation/illicit_trade/documents/Project_Star_2010_Results.pdf (accessed 25 July 2013). Comptroller and Auditor General. Progress in tackling tobacco smuggling. National Audit OfficeOffice NA, 2013. http://www.nao.org.uk/report/progress-in-tackling-tobacco-smuggling/ (accessed 25 Jul 2013).
. Ukraine's ‘lost’ cigarettes flood Europe. International Consortium of Investigative Journalists, 2009. http://www.icij.org/project/tobacco-underground/ukraines-lost-cigarettes-flood-europe (accessed 25 Jul 2013). European Commission. Anti-contraband and anti-counterfeit agreement and general release dated July 9, 2004 among Philip Morris International, Philip Morris Products, Philip Morris Duty Free, and Philip Morris Trade Sarl, the European Community represented by the European Commission and each Member State listed on the signature pages hereto. European Union, 2004. European Commission. Cooperation agreement between British-American Tobacco (Holdings) Limited and the European Union as represented by the European Commission and the signatory Member States of the European Union. European Union, 2010. http://ec.europa.eu/anti_fraud/documents/cigarette_smug/2010/bat_main_agreement.pdf (accessed 12 Sep 2013). European Commission. Co-operation agreement dated as of 27 September 2010 among Imperial Tobacco Limited and the European Union represented by the European Commission and each Member State listed on the signature pages hereto. European Union, 2010. http://ec.europa.eu/anti_fraud/documents/cigarette_smug/2010_i/agreement_sept_2010.pdf (accessed 12 Sep 2013). European Commission. JT International SA, JT International Holding BV and the European Community and the participating Member States. European Union, 2007. http://ec.europa.eu/anti_fraud/documents/cigarette_smug/2007/cooperation_agreement.pdf (accessed 17 Sep 2013).
. Question for written answer to the Commission, Rule 117. European Parliament, 2013. http://www.europarl.europa.eu/sides/getAllAnswers.do?reference=E-2013-007681&language=EN (accessed 7 Oct 2013).
. EU probes cigarette deal that may have aided Syria. The Wall Street Journal. 21 August 2012. http://online.wsj.com/news/articles/SB10000872396390444233104577595221203321922 [Accessed 7 Oct 2013]. Committee of Public Accounts. HM Revenue & Customs: Progress in tackling tobacco smuggling. House of Commons, 2013.
. Tobacco industry and market response to tax policies. Tobacco industry influence over tobacco tax policy during privitisation and European Union accession in Poland. The PPACTE Consortium, 2012.
. Towards a greater understanding of the illicit tobacco trade in Europe: A review of the PMI funded, KPMG authored “Project Star” report. Tob Control 2014;23:e51–61. Imperial Tobacco. Bad for business; bad for consumers; good for criminals; Standardised packaging is unjustified, anti-competitive and anti-business; A response to the UK Department of Health consultation on standardised packaging of tobacco products. 2012. http://www.imperial-tobacco.co.uk/files/misc/plain_packaging_submission.pdf (accessed 25 July 2013). Japan Tobacco International. Response to the Department of Health's consultation on the standardised packaging of tobacco products. 2012. http://www.jti.com/files/4013/4149/4323/Packaging_Response.pdf (accessed 25 Jul 2013). Philip Morris International. Standardised tobacco packaging will harm public health and cost UK taxpayers billions: A response to the Department of Health consultation on standardised packaging of tobacco products. 2012. http://www.pmi.com/eng/tobacco_regulation/submissions/documents/submission%20and%20all%20annexes%20(combined).pdf (accessed 21 June 2013). Japan Tobacco International. The billion pound drop—The impact of tobacco smuggling and cross-border shopping in the UK. International JT. 2012. http://www.tobaccoretailing.com/images/downloads/TheBillionPoundDrop.pdf (accessed 25 Jul 2013). All Party Parliamentary Group on Smoking and Health. Inquiry into the illicit trade in tobacco products. 2013. http://www.ash.org.uk/APPGillicit2013 (accessed 25 Jul 2013). British American Tobacco. UK Standardised Packaging Consultation: Response of British American Tobacco UK Ltd. 2012. http://www.bat.com/group/sites/uk__3mnfen.nsf/vwPagesWebLive/DO8WZC5E/$FILE/medMD8WZC6J.pdf (accessed 25 Jul 2013).
. What is known about tobacco industry efforts to influence tobacco tax? A systematic review of empirical studies. Tob Control 2013 2013;22:e1.
. Illicit trade, tobacco industry-funded studies and policy influence in the EU and UK. Tob Control 2014;23:81–3.
. Will plain packaging reduce cigarette consumption? Econ Pap: J Appl Econ Policy 2012;31:303–17.
. The truth about cigarette price increases in the UK. Tob Control 2014;23:e15–16.
. The Irish tobacco industry position on price increases on tobacco products. Tob Control 2012;21:514–16. Imperial Tobacco. NoNannyState.com. http://www.nonannystate.com.au/ (accessed 25 Jul 2013). Pricewaterhouse Coopers. Australia's illegal tobacco market—counting the cost of Australia's black market. Australia B. 2010. http://www.smoke-free.ca/plain-packaging/documents/industry-responses/PwC_report_-_Illegal_Tobacco_-_counting_the_cost_of_Australias_black_market_February_2010.pdf (accessed 25 Jul 2013). Deloitte. Illicit trade of tobacco in Australia. 2011. http://www.bata.com.au/group/sites/bat_7wykg8.nsf/vwPagesWebLive/DO7WYLJQ/$FILE/medMD8WSDPX.pdf?openelement (accessed 25 Jul 2013).
. Big Tobacco lobby ‘scaremongering’. The Age. 22 May 2011.
. We'll flood the market with cheap tobacco, says British American Tobacco chief. The Daily Telegraph (Australia). 17 May 2011.
. Big tobacco filters out the truth. Australian Financial Review. 7 June 2011.
. New packs will leave bad taste in taxpayers’ mouth. The Australian. 8 April 2011:5.
. The great tobacco wars. Australian Financial Review. 21 May 2011:29. Reuters. Imperial Tobacco challenges Australian Government plain packaging. 6 December 2011. Philip Morris Asia Limited. PMI Asia files lawsuit against the Australian Government over plain packaging. 2011. http://phx.corporate-ir.net/External.File?item=UGFyZW50SUQ9MTE2MTIwfENoaWxkSUQ9LTF8VHlwZT0z&t=1 (accessed 25 Jul 2013).
. Countering tobacco tactics: a guide to identifying, monitoring and preventing Tobacco Industry interference in public health. Australia: ASH, 2010. http://www.ashaust.org.au/pdfs/TItacticsGuide.pdf (accessed 25 Jul 2013). Quit Victoria Cancer Council. Illicit trade of tobacco in Australia. A report prepared by Deloitte for British American Tobacco Australia Limited, Philip Morris Limited and Imperial Tobacco Australia Limited. Quit Victoria: Cancer Council, 2011. http://www.cancervic.org.au/downloads/mini_sites/Plain-facts/CommtsDeloitte12.8.11_FINAL.pdf (accessed 21 Nov 2011). Department of Health. Healthy lives, healthy people: a tobacco control plan for England. HM Government, 2011. https://www.gov.uk/government/uploads/system/uploads/attachment_data/file/213757/dh_124960.pdf (accessed 25 Jul 2013).
. Plain packaging of tobacco products. House of Commons Library, 2013.
. Fag packet ban ‘boosts terror’—Move is a ‘gift to black market’ says boss. The Sun. 25 May 2012.
. Lansley out of his mind over ‘blank cheque’ for criminals. The Grocer. 12 March 2011:16.
. Smuggling the Tobacco Industry and plain packs. UK: Cancer Research, 2012. http://www.cancerresearchuk.org/prod_consump/groups/cr_common/@nre/@new/@pre/documents/generalcontent/smuggling_execsummary.pdf (accessed 25 Jul 2013). HM Revenue and Customs. Tobacco tax gap estimates 2012–13. 11 October 2013. http://www.hmrc.gov.uk/statistics/tax-gaps/ttg-2013.pdf (accessed 15 Oct 2013).
. Tobacco in Australia: Facts and issues. Cancer Council Victoria, 2012. http://www.tobaccoinaustralia.org.au/ (accessed 25 Jul 2013).
. Illicit tobacco trade in Europe: issues and solutions. PPACTE, 2011. http://www.ppacte.eu/index.php?option=com_docman&task=doc_download&gid=187&Itemid (accessed 30 Apr 2013). International Agency for Research on Cancer. Tax avoidance and tax evasion. Effectiveness of price and tax policies for control of tobacco IARC handbooks of cancer prevention: Tobacco control. France: Lyon, 2011:297–326.
. Contrasting academic and tobacco industry estimates of illicit cigarette trade: evidence from Warsaw, Poland. Tob Control 2014;23: e30–4.
. Tabaksteuern, schmuggel und unversteuerte zigaretten—Zur glaubwürdigkeit der entsorgungsstudie der tabakindustrie. Gesundheitswesen 2011;73:705–12.
. Email to Fresh, Irish Revenue and Commissioner's Office, 19 March 2013.
. TMA Response to the APPG on smoking and health: Inquiry into the illicit trade in tobacco products and the implications of the illicit trade protocol. 2012. World Health Organization. WHO Framework Convention on Tobacco Control. WHO, 2003. http://www.who.int/fctc/en/ (accessed 24 Jul 2013). HM Revenue and Customs. Tackling tobacco smuggling–building on our success—A renewed strategy for HM Revenue & Customs and the UK Border Agency. 2011. http://customs.hmrc.gov.uk/channelsPortalWebApp/downloadFile?contentID=HMCE_PROD1_031246 (accessed 25 Jul 2013). HM Revenue and Customs. Measuring tax gaps 2010. 2010. http://www.hmrc.gov.uk/statistics/tax-gaps/mtg-2010.pdf (accessed 25 Jul 2013). Nexis. Website home page. http://www.lexisnexis.com (accessed Mar 2013). KPMG. Project Star 2011 results. 2012. http://www.pmi.com/eng/tobacco_regulation/illicit_trade/documents/project%20star%202011%20results.pdf (accessed 25 Jul 2013). KPMG. Project Star 2012 Results. KPMG LLP, 2013. http://www.pmi.com/eng/media_center/media_kit/Documents/Project_Star_2012_Final_Report.pdf (accessed 20 Apr 2013). HM Revenue and Customs. Measuring tax gaps 2011. 21 September 2011. http://www.hmrc.gov.uk/statistics/tax-gaps/mtg-2011.pdf (accessed 25 Jul 2013). HM Revenue and Customs. Measuring tax gaps 2012. 18 October 2012. http://www.hmrc.gov.uk/statistics/tax-gaps/mtg-2012.pdf (accessed 25 Jul 2013).
. European survey on smoking. PPACTE Consortium, 2011. http://www.ppacte.eu/index.php?option=com_docman&task=doc_download&gid=185&Itemid=29 (accessed 25 Jul 2013).
. South West illicit tobacco study, regional assessment & campaign evaluation. Research NM, 2013.
. South West regional illicit tobacco survey. NEMS Market Research, 2010. NEMS Market Research. North of England illicit tobacco survey. 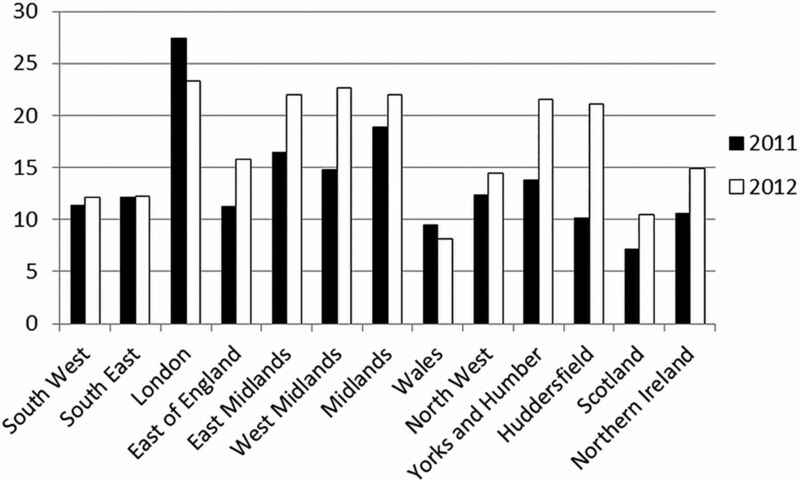 2009. http://www.nemsmr.co.uk/casestudy.aspx?ID=44 (accessed 25 Jul 2013).
. North of England illicit tobacco survey. NEMS Market Research, 2011. http://www.illicittobacconorth.org/FileUploads/Illicit_tobacco_programme_public_opinion_report_2011.pdf (accessed 25 Jul 2013).
. North East illicit tobacco survey. Research NM, 2013. http://www.illicittobacconorth.org/FileUploads/NE_Illicit_Tobacco_Report_key_findings.pdf (accessed 25 Jul 2013). Town is a hotspot for black market cigarettes. Kent Messenger. 3 October 2011. Illicit tobacco rates are ‘real problem’. Yorkshire Evening Post. 12 November 2012. Nearly 20 per cent of Newport cigs counterfeits or foreign. South Wales Argus. 19 September 2012. Illicit cigarette problem worsens. Sunderland Echo. 19 September 2012.
. One in five cig packs revealed to be fake: Arsenic, asbestos found in dodgy tobacco Huddersfield Daily Examiner. 8 October 2012. Black market cigarette sales are increasing. Portsmouth News. 3 May 2013.
. Organised criminals target Scots smokers with illegal cigarettes. The Scotsman. 8 August 2011. 10% puff illicit cigs. The Sun. 9 August 2011.
. One in 10 cigarettes being bought illegally, says study. The Herald (Glasgow). 9 August 2011. 15% of cigs sold in Blackburn are counterfeit. Lancashire Telegraph. 17 August 2011.
. 11,845 dodgy cigs seized in single day; Fake fags among haul confiscated from four city shops. Lincolnshire Echo. 30 September 2011. Counterfeit and foreign cigarette levels. Wells Journal. 27 September 2012. Rise in illegal cigarettes. The Star (Sheffield). 3 October 2012.
. Our black market fags shame: Illegal cigarettes funding gangsters, warns new survey. Paisley Daily Express. 10 August 2011. Illicit tobacco use ‘among highest’. Plymouth Herald. 1 September 2011.
. Tens of thousands smoking illegal tobacco in Blackburn, investigation reveals. Lancashire Telegraph. 21 December 2011. Illegal tobacco trade is damaging for newsagents. Bradford Telegraph and Argus. 28 December 2011.
. New drive to stub out illegal cigarette trade. Manchester Evening News. 13 September 2011. N/Abbey tops illegal cig table. Irish News. 6 March 2012. NI Smoking Most Illegal Cigarettes. The Mirror. 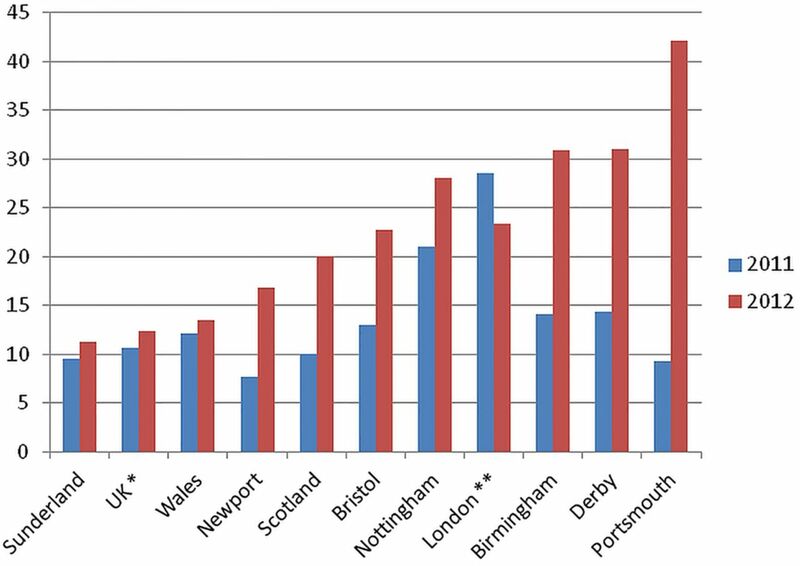 6 March 2012.
. Smokers failing to do their duty; Coventry is fourth worst city in country at paying tax on tobacco. Coventry Evening Telegraph. 6 March 2012.
. UK's top two hotspots for illegal cigarettes in Ulster. Belfast Telegraph. 6 March 2012. 66% of Newtownabbey tobacco illicit. Belfast Telegraph. 11 April 2012.
. Boom in Fake Cigs. Sunday Mirror. 26 February 2012.
. City 'one of the worst places in whole of UK for illicit cigarettes’. Derby Evening Telegraph. 16 November 2012.
. Fake fags health danger warning; Seized cigs contain rat droppings and asbestos. Liverpool Echo. 6 November 2012. Hot trade in illegal fags. Sunday Mail. 26 February 2012. One in four is smoking illegally. Bristol Evening Post. 2 June 2011.
. £85m: cost of illegal cigarettes to our coffers. Belfast Telegraph. 20 October 2011. Third of cigarettes come without duty. Western Daily Press. 6 March 2012. Fake fags flooding city. Sunday Mercury. 18 November 2012.
. Tobacco firms warn of flood of illegal cigarettes into UK. The Independent on Sunday. 18 November 2012.
. A quarter of UK Cigs are ‘duty free’. The Evening Standard. 19 November 2012. Tax alert on illegal cigs. The People. 26 February 2012.
. One in seven cigarettes in city ‘from an illicit source’. Derby Evening Telegraph. 20 September 2011.
. Scourge of illegal fags. Burton Mail. 7 November 2012.
. Imperial warns of black-market toll. Independent. 30 January 2013.
. UK cigarette black market surging, warns Imperial. The Evening Standard. 30 January 2013. One cigarette in five ‘is duty-free’. i-Independent. 31 January 2013.
. Fake fag frenzy; Fear on dodgy cigs as 1 in 4 smoked by Brits is illegal. The Sun. 31 January 2013.
. Daily Mail. 31 January 2013.
. Tobacco smuggling spivs ‘rob taxpayer’. The Express. 31 January 2103.
. Profits up in smoke. Daily Star. 31 January 2013.
. 780,000 That's how many illegal cigs are smoked in Notts every day. Nottingham Evening Post. 7 February 2013. One in four cigs illegal. Birmingham Mail. 16 February 2013. Illegal tobacco sales on the increase. The Western Mail. 16 February 2013.
. Illegal cigs trade hits Imperial. Evening Post. 20 February 2013.
. Human excrement, asbestos and dead flies: The ingredients found in fake cigarettes that cost the taxpayer billions. Daily Mail. 9 September 2012.
. 25% of Town Tobacco from Black Market; Huddersfield near top for illegal cigs in UK. Huddersfield Daily Examiner. 12 March 2012.
. Fake fags filled with poo, dead flies and mould; Shock discoveries as detectives lift the lid on rise in counterfeit cigarette trade. Sunday Mercury. 9 September 2012.
. One in three cigarettes in London ‘from black market’. The Metro. 9 March 2012.
. Cigs sold to kids For 20p. Birmingham Evening Mail. 27 April 2012.
. Leeds: Illicit tobacco rates are real problem’. Yorkshire Evening Post. 12 November 2012. Black market cigarette sales are increasing. The News (Portsmouth). 5 March 2013. HM Revenue and Customs. Measuring tax gaps. http://www.hmrc.gov.uk/statistics/tax-gaps.htm#3 (accessed 25 Jul 2013). HM Revenue and Customs. Measuring Tax Gaps: Tables. 2013. http://www.hmrc.gov.uk/statistics/tax-gaps/mtg-table2013.xls (accessed 16 Oct 2013).
. Email to Andrew Rowell 2013. Philip Morris International. Philip Morris International: New study finds EU black market for cigarettes reaches record high; Member State tax loss an estimated €12.5 billion. Philip Morris International, 2013. http://www.pmi.com/eng/media_center/press_releases/pages/201304170400.aspx (accessed 7 Oct 2013). Cancer Research UK. Further adverts from Japan Tobacco International ruled misleading. 2013. http://www.cancerresearchuk.org/cancer-info/news/archive/pressrelease/2013-04-17-further-adverts-from-japan-tobacco-international-ruled-misleading (accessed 21 Jun 2013). Philip Morris International. UK corporate affairs update. March 2012.
. Eliminating the global illicit cigarette trade—what do we really know? Addiction 2010;105:1650–1.
. The Micro-geography of tax avoidance: Evidence from littered cigarette packs in Chicago. Am Econ J Econ Policy 2010;2:61–84. House of Representatives Standing Committee on Health and Ageing. Advisory report on the Tobacco Plain Packaging Bill 2011 and the Trade Marks Amendment (Tobacco Plain Packaging) Bill 2011. ACT, 2011.
. Understanding tobacco industry pricing strategy and whether it undermines tobacco tax policy: the example of the British cigarette market. Addiction 2013;108:1317–26.
. A mountain or a molehill: is the illicit trade in cigarettes undermining tobacco control policy in South Africa? Trends Organized Crime 2010;13:299–315. Contributors ABG and AR conceived the idea for the study, analysed the press coverage, industry and independent data, and wrote and edited the paper. AR collated the data. KE-R analysed the reporting of HMRC data in The Billion Pound Drop report and edited the paper. All authors approved the final version. Funding This work was supported by grant number RO1CA160695 from the US National Cancer Institute. The underlying industry monitoring that informed the need for this more detailed study is funded by Cancer Research UK, grant no. C48078/A16481. ABG and AR are members of the UK Centre for Tobacco Control Studies (UKCTCS), a UK Centre for Public Health Excellence. Funding to UKCTCS from the British Heart Foundation, Cancer Research UK, the Economic and Social Research Council, the Medical Research Council and the National Institute of Health Research, under the auspices of the UK Clinical Research Collaboration, is gratefully acknowledged. The funders played no role in the study design, analysis and interpretation of data, nor writing of the report or the decision to submit the article for publication. Data sharing statement The data are available upon request.